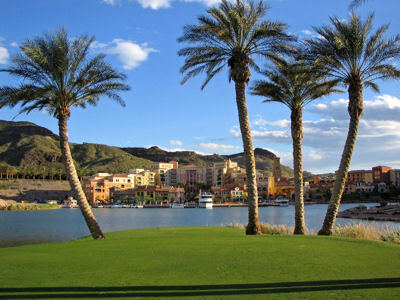 On most "Ultimate Golf Trips" I am all about maximizing my golfing experience at the lowest price possible. That usually involves researching twilight rates, eating hot dogs every lunch, and sleeping on the couch at a friend/relative's house. But occasionally there comes a time where those things are tossed to the side and you drop more money on green fees than you'd ever let your wife spend on a shopping spree, engorge yourself eating at lavish buffets, and retire each night in posh hotel accommodations! When that opportunity arises it is time to VIVA LAS VEGAS baby! Anyone who has made the trip down I-15 to Nevada knows that Las Vegas doesn't do anything halfhearted, and the golf courses are no exception. 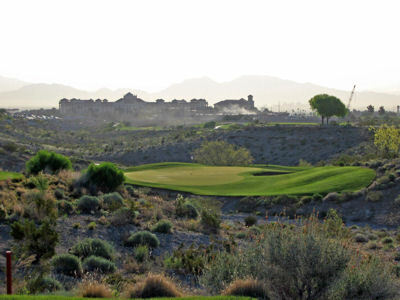 Just as Vegas headlines big stars like Celine Dion, Blue Man Group, and David Copperfield, Vegas courses feature big name designers such as Tom Fazio, Jack Nicklaus, and Rees Jones. It is a constant battle of who can out do who as money seems to be no object in this desert oasis. All you have to do now is grab a buddy and convince your wives, like the Gurus do, that you can travel to the city of sin with only committing the sin of gluttony at the buffet line and in the amount of golf played. Ah, few things feel better than the first day of a golf trip. My clubs are clean, a fresh box of Pro V1s rest in my bag, and my cell phone is turned off. I also can't forget my digital camera so I can upload my pictures into screen saver at work after the trip. The Gurus load up and take off to Las Vegas for a three day trip that ends up feeling like three hours to us but more like three weeks to our wives and kids. Like most golf trips we plan, the agenda of courses is set to climb in quality until the trip climaxes the final day when the most phenomenal course of the trip will be played. Day 1: Don't let that last sentence fool you, day one hardly starts with 'low quality' golf; especially since this particular trip starts with a PGA Tour stop and then a collection of Jack Nicklaus' best holes. 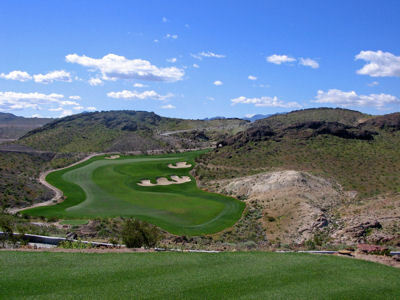 That's right, the opening shot of the trip will be from the very tee box that PGA Tour pros tee it up each October during the Michelin Championship at Las Vegas held at the TPC at the Canyons course. TPC Canyons co-hosts the event with TPC Summerlin (a private facility) and represents one of the few public access courses which allows you to play where the pros play. After getting through the front nine where you will face a par three featuring a desert 'island' green followed by a long par four boasting a 200 yard forced carry over a desert barranca, the back nine shows you why it is called TPC at the Canyons. A deep arroyo runs between the signature 13th and 14th holes offering challenging risk/reward features and characterizing the course. The 18th hole is a fantastic 447 yard par 4 that runs downhill and features bunkers on both sides of the fairway in the landing area along with a green that is well protected with three bunkers on the right and water all along the left. 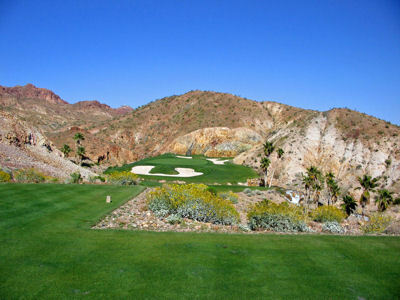 A round of golf at TPC Canyons will run $80 - $265 depending on the season, date, and time you play. The afternoon round keeps us in the Summerlin area of Las Vegas at the popular Bear's Best facility. Bear's Best is a replication of 18 different holes designed by Jack Nicklaus at various courses across the Western U.S. and Mexico. After meeting our forecaddie and eating the complimentary lunch, I was anxious to get to the first tee. My biggest anticipation, which should also be a thrill for many local players, was playing the two replica holes from Old Works in Anaconda, MT. The fourth hole of the day brings you to the first Old Works hole, an excellent replication of the 238 yard downhill par three 7th hole. The signature black sand was shipped down from Anaconda and placed around the green and in the bunkers. It isn't until the 11th hole before you find the other Old Works replica; a copy of Old Works' 2nd hole. I have to admit this replica is a bit anticlimactic since it is already a ho-hum hole and because the replica is significantly shorter than the original. Either Mr. Nicklaus really likes that hole or it is really easy to duplicate because it is the only Old Works hole featured in the Atlanta Bear's Best course. The best hole of the day is the 18th, a fantastic replication of the 18th hole at the PGA West Nicklaus Tournament course in La Quinta, CA. A brutal 450 yard par four with a long sand bunker running along side the water hazard that both run the entire right side of the fairway and green, the original hole produced several dramatics as the finishing hole at the 2004 PGA Tour Q-School. Fortunately at Bear's Best, I had nothing more than a skin riding on the replication hole since I got stuck in the deep green side bunker that took, well; let's just say more than one stroke to get out of! Bear's Best will set you back $195 - $245 plus $25 for your forecaddie. The day wraps up with a trip to the Mirage buffet where there are more food stations than most rural cities have restaurants. After devouring more steak and Banana's Foster in one evening than I had eaten in the past six months combined, it is off to bed for some much needed rest. 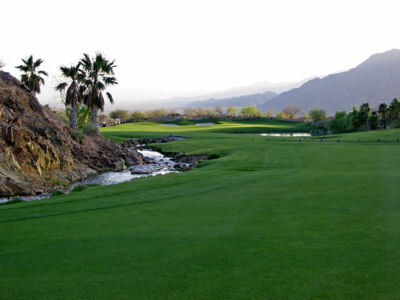 Day 2: The second day takes us to Henderson and is spent at the high end Lake Las Vegas Resort which offers designs from two of golf's greatest players: Tom Weiskopf and Jack Nicklaus. While the morning round at the Weiskopf course gets its uninspiring name, The Falls, from the waterfalls featured on the 11th and 17th holes, the real drama plays of the course plays out on the other holes featured on the back nine. 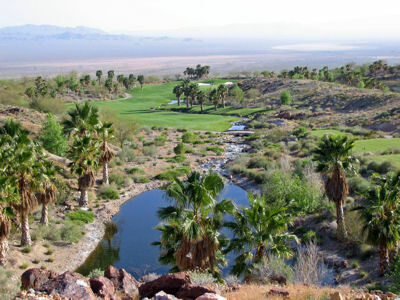 This mountainous back nine features over 300 feet of elevation change through one of the best three hole (12, 13, 14) stretches in the Las Vegas area. 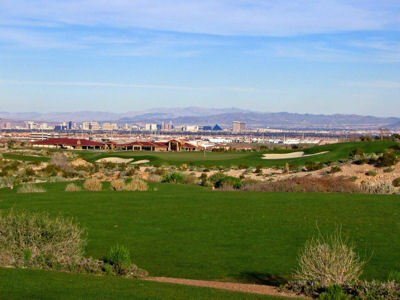 The cliffhanging 12th green offers stunning views of Las Vegas and the strip that are unrivaled. Finishing that hole takes you to the signature 388 yard par four 13th. The elevated tee shot offered here is the kind you'd love to hit time and time again. A natural rock arch is featured on the inside corner of this dogleg right hole that would blend in perfectly with the type of holes you find at Wolf Creek in Mesquite. The hole finishes in a natural rock amphitheater where the slope on the green is so severe that approach shots hitting the front of the green with much spin very well may find themselves rolling back down the hill and 40 yards from the pin. The 14th hole is a classic Weiskopf drivable par four from a tee that is elevated at least 100 above the green, and generally downwind. As I let my drive rip, my feelings of exhilaration quickly faded to desperation as I watched my tee shot begin to draw toward the cart path near the green where the unaware beverage gal had just pulled up and parked her cart. Never had I been so glad to see my tee shot comes to rest in the rough. Fortunately her heart rate only doubled when my ball landed just beyond her, which was better than resulting in no heart rate at all if that ball had come down about ten feet sooner! Like crossing the road as a young child, I've learned my lesson to look both ways before teeing up my driver. Finishing up the round and then grabbing lunch in the clubhouse at Reflection Bay, the afternoon 18 holes at one of Nicklaus' best designs, features quality food and country club service. As great as the stretch of the 12th-14th holes at The Falls is, its biggest Vegas rival is the prettier 7th - 9th holes at Reflection Bay. How pretty is it? Tune in to ABC in December where coverage of the Wendy's Three-Tour Challenge at Reflection Bay will be featured and you'll see for yourself. Both nines finish with picturesque holes along the shoreline of Lake Las Vegas, while the dramatic downhill 7th hole is one of best par 4s I've had the opportunity to play. The tee shot offers a fairway wood or long iron down the left side and dropping in front of the creek that runs across the fairway, or you can blast a driver over a rocky point to the blind right extreme of the fairway. The approach is to a beautiful lakeside green protected by a pot bunker in front and sand with palm trees across the back; it must be played to be appreciated. Nicklaus was clearly thinking of his favorite course, Pebble Beach, when he designed the finishing hole as a flip-flop Vegas version of the 18th at Pebble. 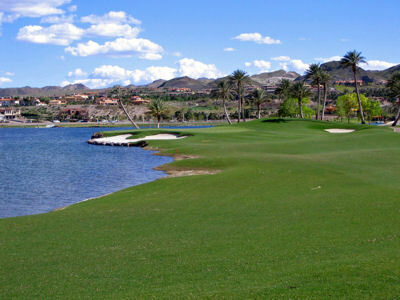 So bring out your 'A' game for the final hole and envision yourself playing along the Pacific Ocean rather than the man-made Lake Las Vegas and finish out with a birdie! 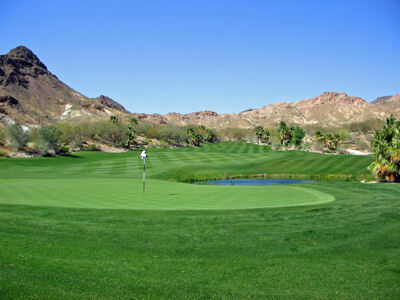 Rates at The Falls and Reflection Bay range from $150 - $270 depending on the season, date, and time of play. Day two concludes with a trip to Fremont Street where we realized a short line at a buffet, we'll leave nameless, is never a good sign on the weekend. We ate a bunch of cold shrimp, but that was all we could stomach considering the limited options. We finish the night heading for our room since pulling an 'all-nighter' isn't for golfers who will be embarking on arguably Las Vegas' finest golf course experience on the morrow. Day 3: Rarely are we satisfied with only 18 holes on a golf trip, but exceptions are made when Cascata is on the agenda (and when you have eight hours to drive home). Cascata very well may be the best unknown course in America. It is amazing to think any course that cost over $60 million (no that's not a misprint) could have such little national hype - especially when it resides in the most hyped city in America. Regardless of the level of recognition, the Harrah's Casino (parent company of Caesar's Palace) owned course is an experience never to be forgotten. The day begins to unfold when we pull up to the entrance gate that blocks non-golfers from cruising the property. After confirming our tee time, it was up the hill to the clubhouse. We are greeted by two gentlemen who open our doors and take our clubs. Our 'host' for the day then takes us into the most memorable clubhouse I've been in to date, and I've been in some amazing 30,000+ square foot clubhouses. A 418 foot waterfall cascades down the mountain and over boulders into a river that literally runs through the middle of the 37,000 square foot clubhouse. I felt like I was at Disneyland heading to one of the rides as we walked across the bridge taking us from the foyer of the clubhouse, over the river, and to the pro shop. We were then escorted to the locker room where we found our names engraved on metal plates on our complimentary lockers for the day. After changing our shoes and taking a bottle of complimentary Gatorade, we were ready to hit the range. Our host informed us we could find our clubs downstairs. As we went downstairs we were greeted by more employees that had our clubs set on the cart and ready to go. We loaded into the plush cart that featured extra padded seats, a jockey/glove box, cooler, and a wooden steering wheel. Once again I felt like I was at Disneyland and embarking on Mr. Toad's Wild Adventure as we began driving out of the clubhouse and to a pair of large wooden doors that automatically opened as we pulled up, leading us out to the practice range. On the practice green, where the greens rolled beautifully and were as a quick as putting on a pool table, we met our caddy. He informed us that Cascata intentionally has very limited play (24 tee times is the max on a weekend and less than ten rounds a day is common) and produces a very private atmosphere. The layout sprawls over hundreds of acres in an effort to keep every hole independent of each other and to make sure the golfer feels like he is all alone in paradise. Just how spread out and private are these holes? Well, at one point it is a full two minute drive on the cart to get from one green to the next tee box. Athletes must bask in the private setting since our caddy let us know he had caddied for New England Patriots star quarterback Tom Brady the previous week and Oakland Raider quarterback Rich Gannon the week before. Cascata is no stranger to celebrities though. Michael Douglas hosts his annual "Celebrity and Friends" golf tournament at Cascata which you can watch on NBC each year. I'd love to try and convey the beauty of this course hole by hole and shot by shot, but it is something you have to go experience for yourself. You will be treated to a handful of waterfalls, impeccable conditioning, complimentary drinks, and the kind of service that makes you feel like a king for the day. Each hole is wonderful on this Rees Jones masterpiece, but you're in for an extra special treat on the downhill 14th and 18th holes where beautiful palm trees, rivers, lakes, and brilliant white sand create the type of beauty and challenge that is difficult to find anywhere. If you've taken the opportunity to treat yourself to a day of golf at the Coeur d'Alene Resort and experienced the level of service and beauty there, take a trip to Cascata where everything is cranked up in a way only Las Vegas can pull off! A weekday round runs $350 while the weekend costs $500, although players staying at Caesars Palace receive a discount. Just like that, the trip is over and we head back for home. Seeing the wife and kids again is great as I whip out the digital camera and try and impress my four year old with pictures of all the great golf holes I've played over the past few days. She's not nearly as impressed as I am, but really excited to see me anyway. The next day it is back to work and the everyday grind, but getting through the day is a little easier as my new pictures show up on my screensaver and it causes me to reflect on another phenomenal golf trip.